ITHACA, N.Y. – Despite the existence of chemical-free methods to eradicate pests, Americans use more than a billion pounds of pesticides per year. These chemicals are mostly out of sight and out of mind to unsuspecting homeowners, who are typically unaware of how to prevent potential harm – something new Cornell University research is addressing. In a study recently published in JSM Health Education & Primary Health Care, College of Human Ecology researchers Joseph Laquatra, Mark Pierce, Alan Hedge and Ann Lemley examined the extent of indoor pesticide pollution in New York state rural homes. Conducting pesticide analyses as part of a larger effort that studied pollutants in homes and child care facilities, the researchers sampled 350 homes in Chenango, Columbia, Essex, Franklin, Wyoming and Hamilton counties, looking for 15 potentially toxic pesticides commonly used in those areas' agricultural practices, with a likelihood of accumulation in the interiors of nearby homes. 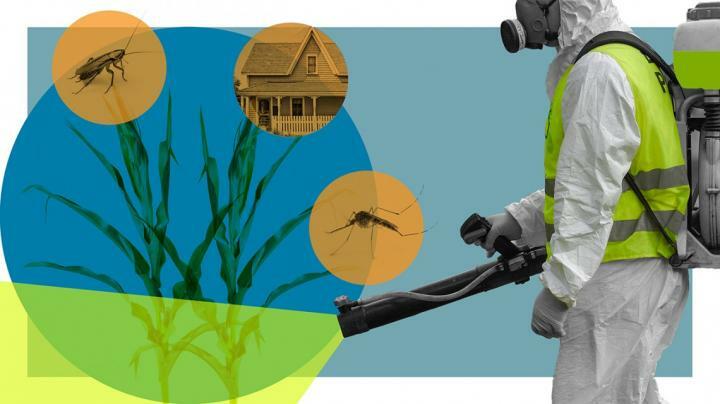 "We found that pesticide residues are ubiquitous in rural homes in New York state," said Laquatra, professor of design and environmental analysis, who noted that positive results for such chemicals were found in every house tested. Particularly concerning to Laquatra and his fellow researchers is what is known about these chemicals and their potential harmfulness to humans, especially infants. "Numerous health problems occur from exposure to pesticides, such as cancer, birth defects, leukemia and ocular [vision-related] toxicity, among a number of other health issues," Laquatra said. "Households with crawling toddlers should be concerned, as toddlers will accumulate pesticide residues on their hands and then ingest them due to hand-to-mouth behaviors." Previous studies of pesticide residues in homes have highlighted entry routes for chemicals that include tracking with shoes, bare feet, clothing or animal fur; airborne entry; and soil gas entry. Adjacency and proximity to agricultural operations have also been cited as factors responsible for residential pesticide residues because of spray drift. Further, pesticides applied to gardens and lawns can follow these same transport routes into a home. Once inside a home, according to research, pesticide residues accumulate in dust and degrade at a lower rate than they do outdoors because they are shielded from the effects of rain, sun and soil microbial activity. According to the study, "Common Pesticide Residues in Rural Homes of New York State," pesticide education programs could include home maintenance guidelines for prevention – and safe eradication – of accumulated pesticide residues, of which consumers may not be aware. Emphasis, said Laquatra, should be placed on the importance of keeping the home clean. "When building new homes or remodeling existing homes, install hard surface, easy-to-clean floors, such as hardwood, tile or resilient flooring. Keep floors clean," he said. "Have a home entry system that captures soil and pollutants at the door. This entry system should consist of a hard-surfaced walkway, such as a paved sidewalk, a grate-like scraper mat outside the entry door, and a highly absorbent doormat that will trap pollutants." These best practices, according to Laquatra, can have vast education and public policy implications to help minimize exposure to residents, not only in New York state but across the country.